The Rolls-Royce Maharaja Phantom Drophead Coupe, a one-of-a-kind bespoke vehicle created exclusively for customers in Dubai, was unveiled at an Indian-themed evening event held in celebration of the car's arrival at the AGMC Rolls-Royce showroom. Age of the Raja, this eye-catchingly beautiful model was conceptualised and hand-crafted by specialists at the Home of Rolls-Royce in Goodwood, England, in honour of Indias affinity with the super-luxury marque. 100 years ago, India's Princes and Maharajas collectively engaged in what is described as one of the world's longest relationships with one automobile manufacturer. Over a period of five decades, the Maharajas purchased over 840 unique Rolls-Royce motor cars pushing the maker of the 'Best Car in the World' to unprecedented levels of design, engineering and luxury. 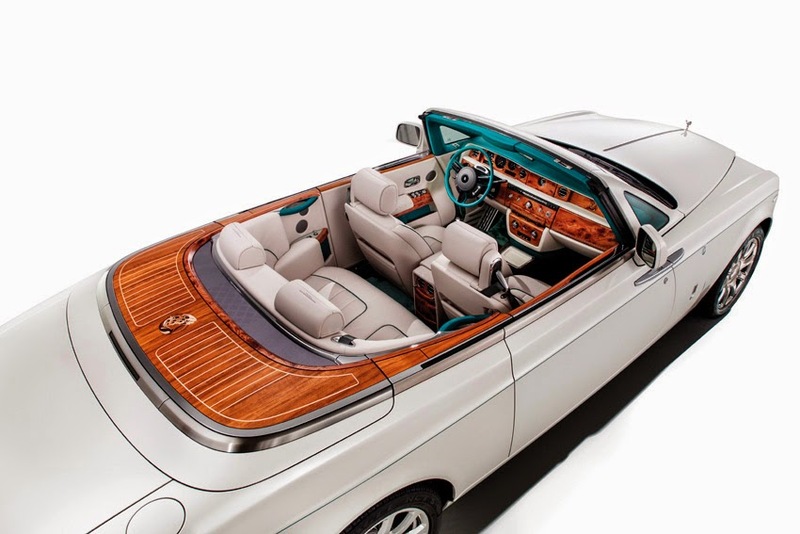 Now, Rolls-Royce Motor Cars is recreating the golden age of India's motoring heritage though a collection of bespoke vehicles inspired by the Maharajas' cars, the first of which is the Rolls-Royce Maharaja Phantom Drophead Coupe unveiled. Dubai is the only market in the world to receive this extraordinary, one-of-a-kind Bespoke Phantom Drophead Coupe, which has been two years in the making - not only an incredible coup for us, but also a strong reflection of the importance that Rolls-Royce Motor Cars places on this market," said Osman Abdelmoneim, General Manager, AGMC. A host of subtle touches have been added to the Rolls-Royce Phantom Coupe to bring the Golden Age of the Raja alive in this extra-ordinary model. The exterior of Maharaja inspired super luxury vehicle dazzles in a carrara white colour, with a Peacock emblem, the national bird of India, completing an Emerald green coachline. A deep green hood retracts to reveal a beautiful deck with a Peacock emblem integrated into the marquetry - a perfect complement to the Peacock detail on the bonnet. The interior continues the striking colour theme by elegantly combining creme light leather with emerald green accents, which is complemented by marquetry inlay on the facia panel top and arm rests. More elaborate Peacock emblems can be found embroidered into the headrests in emerald green and cobalto blue, as well as a Peacock feather pattern in seashell stitching on the side and central armrests. The bespoke Maharaja Peacock clock complements the interior colours with cobalto blue and jade elements.